WAIST HIGH: The Blitz Club Returns For One Night Only. The Blitz Club Returns For One Night Only. 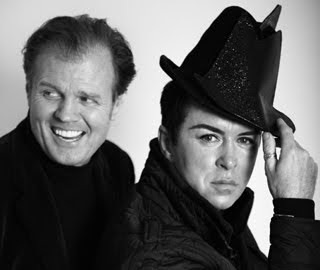 Tomorrow night Steve Strange and Rusty Egan will present The Blitz Club for the first time in thirty years at the original site of one of the most celebrated clubs in UK history. The Blitz Club, for which Strange was the doorman and Egan was the DJ, was the heart of the music, art and fashion scene that would go onto become known as New Romanticism. From The Blitz Club: Its over 30 years since we held the last Blitz Club event in Covent Garden. Although we went on to host the famed Club For Heroes, history seems to have decreed that "The Blitz Club" was that special moment in time. It is the place where fashion, music and circumstance gave birth to the New Romantic movement and in turn the template for the 80's. So its with equal measures of pleasure, anticipation, romanticism and trepidation that we announce the first official event in over 30 years. Steve Strange and Rusty Egan present "The Blitz Club" in the original building where it all began in 1979. The building isnt called the Blitz any more (its now The Red Rooms, A Gentlemen’s Club) and the furniture may have changed but there is no doubt, we are heading back to our spiritual home. Steve and Rosemary will be hosting and Rusty and Princess Julia will be DJ'ing. To complete the circle the band Paradise Point (who features Roman Kemp, the son of Spandau Ballets Martin Kemp) will play live. Expect some Blitz Kids as well. We are even trying to persuade Steve to bring his full length mirror for the door.